This weekend I had a night out with my best friend and my boyfriend. I put on a super cute sequin top from Buckle and a pair of black leggings. My shoes made my night. 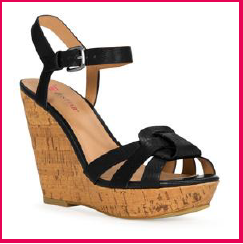 They are Lola Daisy Wedge Sandals in black from Just Fab. Let me just tell you these were so comfortable all night and I didn't even come close to slipping or falling. I love how they elongated my legs. Seriously these are adorable and Just Fab has a huge selection of wedge sandals that I am in love with, and next week I'll show you the other pair I got from them!